Sargam Brass Band established in year 1980, we are an acclaimed marriage making service providers. Ideally located in Mumbai, Maharashtra we are a renowned name in event promoters and ceremony specialists. Our collection of services includes traditional music and dance, illumination, fireworks, chariot service and many more. Our wide array of qualitative services complements even the most demanding client. With cost effective propositions and on time services, we are consistently approached by numerous clients. Our unique solutions are custom made to exceed our client expectation in terms of quality and presentation Quality has been the landmark feature of the group. Our selective services are widely appreciated for its creative designing and superb execution. We are one-stop shop for Brass Band complete solutions. We add personal touch to every project by offering choicest options and services. Our group is known for its class quality and stands at the top, in client satisfaction. Our transparent strategies and high business ethics have won the hearts of our prized clientele; we remain highly appreciated by tremendous client base. 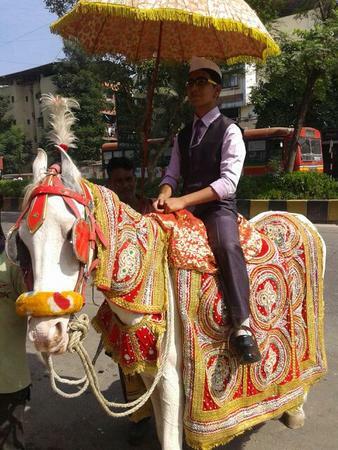 We will of course be pleased to respond to your Indian wedding requirements anywhere in Maharashtra. Please make your booking early to avoid disappointment Book our White wedding horses for your special wedding day Make your Indian wedding dreams come true. Sargam Brass Band is a brass band based out of Mumbai . Sargam Brass Band's telephone number is 76-66-77-88-99, address is Ghatkopar West, Mumbai, Maharashtra, India. Sargam Brass Band is mainly known for Wedding Brass Band, Band Baaja, Safa, Dhol, Baraat Services.. In terms of pricing Sargam Brass Band offers various packages starting at Rs 0/-. There are 0 albums here at Weddingz -- suggest you have a look. Call weddingz.in to book Sargam Brass Band at guaranteed prices and with peace of mind.